Nobel-prize-winning schoolgirl Malala Yousafzai has said she is a proud Brummie, as a new portrait of her was unveiled in her adopted home. 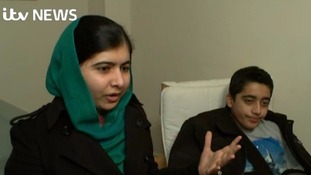 Malala Yousafzai has met a survivor of the Peshawar school massacre who is now recovering in the UK. Malala Yousafzai urged world leaders to provide free education for every child as she received the Nobel Peace Prize today. Yousafzai - shot by the Taliban in 2012 for promoting girls' rights to education - is the youngest person to receive the award. The 17-year-old joked at the ceremony in Oslo, Norway that she was certain she was the first recipient of the Nobel Peace Prize "who still fights with her younger brothers". Malala Yousafzai has donated $50,000 to the United Nations Relief and Works Agency after winning the World's Children's Prize. An advertising agency has apologised after using a cartoon of Pakistani schoolgirl Malala Yousafzai being shot in the face to advertise a mattress company. A spokesman for Ogilvy & Mather said the campaign, created by the firm's India office, "are contrary to the beliefs and professional standards of Ogilvy & Mather and our clients." "We deeply regret this incident and want to personally apologise to Malala Yousafzai and her family," spokesman Greg Carton said. "We are investigating how our standards were compromised in this case and will take whatever corrective action is necessary." An ad agency has caused outrage after creating a promotion for a mattress company using images of Malala Yousafzai being shot in the face. Nelson Mandela is physically separated from us but his soul and spirit will never die. He belongs to the whole world because he is an icon of equality, freedom and love, the values we need all the time everywhere. His long, long struggle is a great demonstration of humanity. I have learned so much from Nelson Mandela and he has been my leader. He is a perpetual inspiration for me and millions of others around the world. A senior Taliban commander wrote a letter to Malala Yousafzai saying she was attacked because of her "smear campaign" against the Taliban. Gordon Brown said "nobody will believe a word the Taliban says" about the right of girls like Malala Yousafzai to have an education "until they stop burning down schools and stop massacring pupils." Following the Taliban commander's letter to Malala in which he accuses her of creating a smear campaign, the UN Special Envoy for Global Education said the Taliban are "on the defensive". Mr Brown said: "The Taliban are on the defensive because four million people, two million of them in Pakistan, have now signed petitions calling for every girl to have their education in safety. "I will visit Pakistan in the next few weeks as we build on Malala Day. During my visit I will step up the pressure for action to ensure that the three to four million Pakistani girls now denied education have a chance to go to school by the end of 2015."